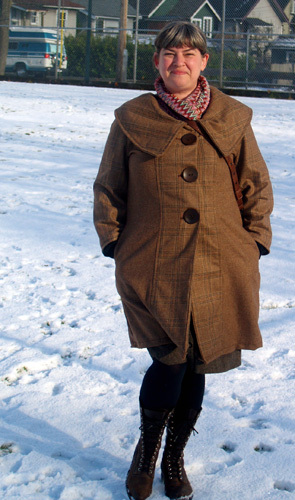 So this is the first wearable outer garment that I’ve made – an unlined wool coat with buttons and everything! Vintage wool from an estate sale, wooden buttons from Button Button, plus Butterick Pattern 5569. A full post about it should be up soon at the Sew Weekly shortly. I’ll link to it when it is. In the meantime, I’m feeling might proud about this particular garment. Fits perfectly, warm enough for most Vancouver weather and cost less than $20 total. Not bad.